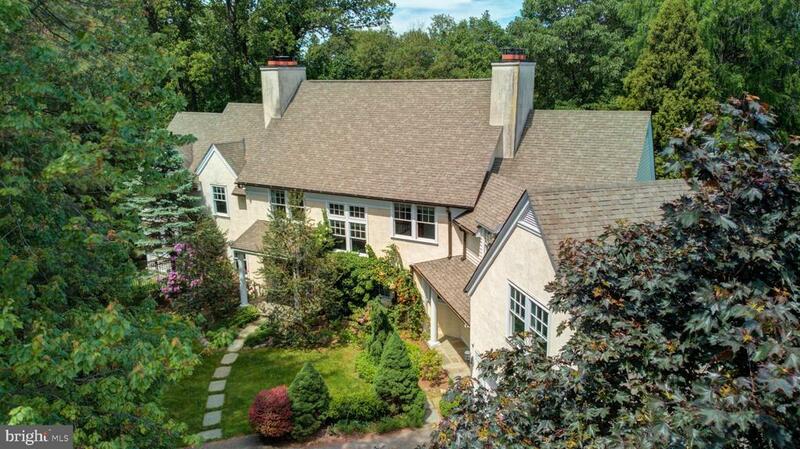 On one of the most exclusive roads bordering the Wissahickon Valley sits this well appointed newer home with all modern amenities. Designed by a local architect, this home was thoughtfully built on this full acre+ of land to enhance and maximize its exposures to the wooded area it borders. Notice the fruit orchard and mature specimen plantings as you turn into the driveway. Upon entering, you can feel the sense of proportion is just right for contemporary living. At one end of the house is an enclosed porch with three exposures, giving you the feeling of being surrounded by peaceful nature. French doors lead you to an inviting living room with a working fireplace and built in bookshelves. The formal dining room entrance is framed by columns as a nod to the architecture of the older mansions in the area. The cooks kitchen features a 6 burner professional grade stove with a double oven, an extravagant amount of counter space and more than ample cabinet storage. There is a lavishly sunny spot for in-kitchen dining. The adjacent nook is the perfect spot for a housing a bar and glassware, grab a glass as you step out onto the adjacent patio! From the kitchen, youll have full view over the family room, with a bar height counter in between. The television is integrated inside the cabinets underneath the counter, another thoughtful detail. Step out the family room doors right onto the pool patio with a luxuriously sized in-ground pool, with evergreen trees along the patios border so theres never a leaf to scoop! The salinated pool has been diligently professionally maintained and has been upgraded through the sellers ownership. A sonos sound system with external built in speakers will make outdoor/ indoor living seamless. On the upper level, a master suite with soaring vaulted ceilings boasts double closets. The adjacent new marble bath is generously sized with double sinks and beautiful fixtures. The second and third bedrooms are comfortably sized and share a jack and jill full bath. There is abundant storage for linens and such in the bathrooms as well as in closets along the hallway. A dedicated laundry room is also on this level- no need to take laundry to the basement! Continue down the hall to a beautiful bedroom with built-in bookshelves that has a gorgeous and updated full-bath. At the end of the hall lies a huge bedroom with vaulted ceilings, mirroring the master bedroom, that can also be used as a studio or giant office space. A clean and dry carpeted finished basement with a bounty of storage complete the interior of this home. This home has 3 zones of central heating and A/C and pro-active owners who made sure everything was well maintained. Attached 2-car garage with direct entrance to interior. The house has been pre-inspected and corrections and repairs have been made in response prior to the listing. This house offers every comfort you could imagine for contemporary living in a secluded and bucolic setting. This one is a must-see!